"Gehrig" redirects here. For other people with the surname, see Gehrig (surname). For the disease sometimes referred to as Lou Gehrig's disease, see Amyotrophic lateral sclerosis. Henry Louis "Lou" or "Buster" Gehrig (Born Heinrich Ludwig Gehrig; June 19, 1903 – June 2, 1941) was an American baseball first baseman who played 17 seasons in Major League Baseball (MLB) for the New York Yankees, from 1923 through 1939. Gehrig was renowned for his prowess as a hitter and for his durability, a trait that earned him his nickname "The Iron Horse". He was an All-Star seven consecutive times, a Triple Crown winner once, an American League (AL) Most Valuable Player twice, and a member of six World Series champion teams. He had a career .340 batting average, .632 slugging average, and a .447 on base average. He hit 493 home runs and had 1,995 runs batted in (RBI). In 1939, he was elected to the Baseball Hall of Fame and was the first MLB player to have his uniform number (4) retired by a team. A native of New York City and attendee of Columbia University, Gehrig signed with the Yankees in 1923. He set several major league records during his career, including the most career grand slams (23) (since broken by Alex Rodriguez) and most consecutive games played (2,130), a record that stood for 56 years and was long considered unbreakable until surpassed by Cal Ripken, Jr. in 1995. Gehrig's streak ended on May 2, 1939, when he voluntarily took himself out of the lineup to stunned fans after his play was hampered by amyotrophic lateral sclerosis (ALS), an incurable neuromuscular disorder now commonly referred to in North America as Lou Gehrig's disease. The disease forced him to retire at age 36 and was the cause of his death two years later. The pathos of his farewell from baseball was capped off by his iconic 1939 "Luckiest Man on the Face of the Earth" speech at Yankee Stadium. Gehrig was voted the greatest first baseman of all time by the Baseball Writers' Association in 1969, and was the leading vote-getter on the Major League Baseball All-Century Team chosen by fans in 1999. A monument in Gehrig's honor, originally dedicated by the Yankees in 1941, currently resides in Monument Park at Yankee Stadium. The Lou Gehrig Memorial Award is given annually to the MLB player best exhibiting his integrity and character. Gehrig was born at 309 East 94th Street in the Yorkville neighborhood of Manhattan, weighing almost 14 pounds (6.4 kg) at birth. He was the second of four children of German immigrants, Christina Foch (1881–1954) and Heinrich Gehrig (1867–1946). His father was a sheet metal worker by trade but frequently unemployed due to alcoholism, and his mother - a maid - was the main breadwinner and disciplinarian in the family. His two sisters died from whooping cough and measles at an early age; a brother also died in infancy. From an early age, Gehrig helped his mother with work, doing tasks such as folding laundry and picking up supplies from the local stores. In 1910, he lived with his parents at 2266 Amsterdam Avenue in Washington Heights. In 1920, the family resided on 8th Avenue in Manhattan. 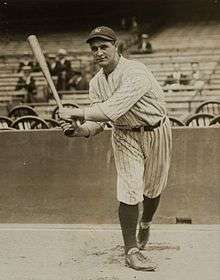 His name was often anglicized to Henry Louis Gehrig and he was known as "Lou" so that he would not be confused with his identically named father, who was known as Henry. Gehrig first garnered national attention for his baseball ability while playing in a game at Cubs Park (now Wrigley Field) on June 26, 1920. His New York School of Commerce team was playing a team from Chicago's Lane Tech High School in front of a crowd of more than 10,000 spectators. With his team leading 8–6 in the top of the ninth inning, Gehrig hit a grand slam completely out of the major league park, an unheard-of feat for a 17-year-old. Gehrig attended PS 132 in the Washington Heights section of Manhattan, then went to Commerce High School, graduating in 1921. He then studied at Columbia University for two years, although he did not graduate. Initially, he went to Columbia on a football scholarship, where he was preparing to pursue a degree in engineering. Before his first semester began, New York Giants manager John McGraw advised him to play summer professional baseball under an assumed name, Henry Lewis, despite the fact that it could jeopardize his collegiate sports eligibility. After he played a dozen games for the Hartford Senators in the Eastern League, he was discovered and banned from collegiate sports his freshman year. 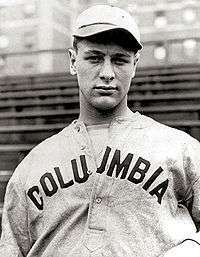 In 1922, Gehrig returned to collegiate sports as a fullback for the Columbia Lions football program. Later, in 1923, he played first base and pitched for the Columbia baseball team. At Columbia, he was a member of Phi Delta Theta fraternity. On April 18, 1923, the same day that Yankee Stadium opened for the first time and Babe Ruth inaugurated the new stadium with a home run against the Boston Red Sox, Columbia pitcher Gehrig struck out seventeen Williams College batters to set a team record, though Columbia lost the game. Only a handful of collegians were at South Field that day, but more significant was the presence of Yankee scout Paul Krichell, who had been trailing Gehrig for some time. It was not Gehrig's pitching that particularly impressed him; rather, it was Gehrig's powerful left-handed hitting. During the time Krichell observed him, Gehrig had hit some of the longest home runs ever seen on various eastern campuses, including a 450-foot (137 m) home run on April 28 at Columbia's South Field, which landed at 116th Street and Broadway. He signed a contract with the Yankees on April 30. He returned to minor-league Hartford to play parts of two seasons, 1923 and 1924, batting .344 and hitting 61 home runs in 193 games. It was the only time Gehrig had ever played any level of baseball—sandlot, high school, collegiate or pro—for a team based outside New York City. 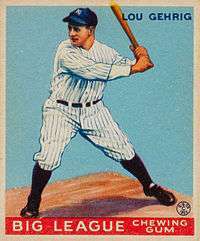 Gehrig joined the New York Yankees midway through the 1923 season and made his Major League debut at age 19 on June 15, 1923, as a pinch hitter. In his first two seasons, he saw limited playing time, mostly as a pinch hitter—he played in only 23 games and was not on the Yankees' 1923 World Series roster. In 1925, he batted .295, with 20 home runs and 68 runs batted in (RBIs). The 23-year-old Yankee first baseman's breakout season came in 1926, when he batted .313 with 47 doubles, an American League-leading 20 triples, 16 home runs, and 112 RBI. In the 1926 World Series against the St. Louis Cardinals, Gehrig hit .348 with two doubles and 4 RBIs. The Cardinals won the series four games to three. In 1927, Gehrig put together one of the greatest seasons by any batter in history, hitting .373, with 218 hits: 101 singles, 52 doubles, 18 triples, 47 home runs, a then-record 175 runs batted in (surpassing teammate Babe Ruth's 171 six years earlier), and a .765 slugging percentage. His 117 extra-base hits that season are second all-time to Babe Ruth's 119 extra-base hits in 1921 and his 447 total bases are third all-time, after Babe Ruth's 457 total bases in 1921 and Rogers Hornsby's 450 in 1922. Gehrig's production helped the 1927 Yankees to a 110–44 record, the AL pennant (by 19 games), and a four-game sweep of the Pittsburgh Pirates in the World Series. Although the AL recognized his season by naming him league MVP, Gehrig's accomplishments were overshadowed by Babe Ruth's 60 home run season and the overall dominance of the 1927 Yankees, a team often cited as having the greatest lineup of all time — the famed "Murderers' Row". Despite playing in the shadow of the larger-than-life Ruth for two-thirds of his career, Gehrig was one of the highest run producers in baseball history: he had 509 RBIs during a three-season stretch (1930–32). Only two other players, Jimmie Foxx with 507 and Hank Greenberg with 503, have surpassed 500 RBIs in any three seasons; their totals were non-consecutive. (Babe Ruth had 498.) Playing 14 complete seasons, Gehrig had 13 consecutive seasons with 100 or more RBIs (a major league record shared with Foxx until eclipsed in 2010 by Alex Rodriguez). Gehrig had six seasons where he batted .350 or better (with a high of .379 in 1930), plus a seventh season at .349. He had seven seasons with 150 or more RBIs, 11 with over 100 walks, eight with 200 or more hits, and five with more than 40 home runs. Gehrig led the American League in runs scored four times, home runs three times, and RBIs five times. His 184 RBIs in 1931 remain the American League record as of 2015 and rank second all-time to Hack Wilson's 191 in 1930. On the single-season RBI list, Gehrig ranks second, fifth (175), and sixth (174), with four additional seasons of over 150 RBIs. He also holds the baseball record for most seasons with 400 total bases or more, accomplishing this feat five times in his career. He batted fourth in the lineup behind Ruth, making it counterproductive to opposing pitchers to intentionally walk Ruth. During the ten seasons (1925–1934) in which Gehrig and Ruth were teammates and next to each other in the batting order and played a majority of the games, Gehrig had more home runs than Ruth only once, in 1934 (which was Ruth's last year with the Yankees), when he hit 49 to Ruth's 22 (Ruth played 125 games that year). They tied at 46 in 1931. Ruth had 424 home runs compared to Gehrig's 347. However, Gehrig outpaced Ruth in RBI, 1,436 to 1,316. Gehrig had a .343 batting average, compared to .338 for Ruth. In 1932, Gehrig became the first player in the 20th century to hit four home runs in a game, accomplishing the feat on June 3 against the Philadelphia Athletics. He narrowly missed getting a fifth home run when Athletics center fielder Al Simmons made a leaping catch of another fly ball at the center field fence. After the game, manager Joe McCarthy told him, "Well, Lou, nobody can take today away from you." On the same day, however, John McGraw announced his retirement after thirty years of managing the New York Giants. McGraw, not Gehrig, got the main headlines in the sports sections the next day. In September 1933, Gehrig married Eleanor Twitchell (1904 or 1905–1984), the daughter of Chicago Parks Commissioner Frank Twitchell. In a 1936 World Series cover story about Lou Gehrig and Carl Hubbell, Time proclaimed Gehrig "the game's No. 1 batsman", who "takes boyish pride in banging a baseball as far, and running around the bases as quickly, as possible". Also in 1936, at the urging of his wife Eleanor, Gehrig agreed to hire Babe Ruth's agent, who in turn, persuaded him to audition for the role of Tarzan, the Ape Man, after Johnny Weissmuller had vacated the iconic movie role. But Gehrig only got as far as posing for a widely distributed, and embarrassing, photo of himself in a leopard-spotted costume. When Tarzan creator Edgar Rice Burroughs spotted the outfit, he telegrammed Gehrig, "I want to congratulate you on being a swell first baseman." On June 1, 1925, Gehrig entered the game as a pinch hitter, substituting for shortstop Paul "Pee Wee" Wanninger. The next day, June 2, Yankee manager Miller Huggins started Gehrig in place of regular first baseman Wally Pipp. Pipp was in a slump, as was the team, so Huggins made several lineup changes to boost their performance, replacing Pipp, Aaron Ward, and Wally Schang. Fourteen years later, Gehrig had played 2,130 consecutive games. 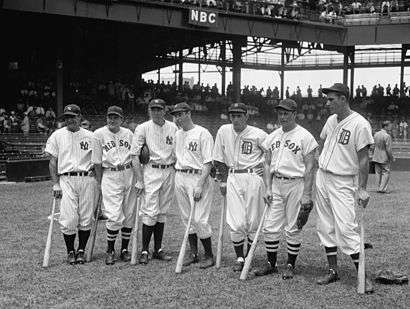 Seven of the American League's 1937 All-Star players, from left to right Lou Gehrig, Joe Cronin, Bill Dickey, Joe DiMaggio, Charlie Gehringer, Jimmie Foxx and Hank Greenberg. All seven would eventually be elected to the Hall of Fame. On April 23, 1933, a pitch by Washington Senators pitcher Earl Whitehill struck Gehrig in the head. Although almost knocked unconscious, Gehrig remained in the game. On June 14, 1933, Gehrig was ejected from a game, along with manager Joe McCarthy, but he had already been at bat. In a June 1934 exhibition game, Gehrig was hit by a pitch just above the right eye and was knocked unconscious. According to news reports, he was out for five minutes. Helmets were not heavily introduced until the 1940s. He left the game, but was in the lineup the next day. On July 13, 1934, Gehrig suffered a "lumbago attack" and had to be assisted off the field. In the next day's away game, he was listed in the lineup as "shortstop", batting lead-off. In his first and only plate appearance, he singled and was promptly replaced by a pinch runner to rest his throbbing back, never taking the field. A&E's Biography speculated that this illness, which he also described as "a cold in his back", might have been the first symptom of his debilitating disease. In addition, X-rays taken late in his life disclosed that Gehrig had sustained several fractures during his playing career, although he remained in the lineup despite those previously undisclosed injuries. On the other hand, the streak was helped when Yankees general manager Ed Barrow postponed a game as a rainout on a day when Gehrig was sick with the flu—even though it was not raining. Gehrig's record of 2,130 consecutive games played stood until September 6, 1995, when Baltimore Orioles shortstop Cal Ripken, Jr. surpassed it. Although his performance in the second half of the 1938 season was slightly better than in the first half, Gehrig reported physical changes at the midway point. At the end of that season, he said, "I tired mid-season. I don't know why, but I just couldn't get going again." Although his final 1938 statistics were above average (.295 batting average, 114 RBI, 170 hits, .523 slugging percentage, 689 plate appearances with only 75 strikeouts, and 29 home runs), they were significantly down from his 1937 season, in which he batted .351 and slugged .643. In the 1938 World Series, he had four hits in 14 at-bats, all singles. When the Yankees began their 1939 spring training in St. Petersburg, Florida, it was clear that Gehrig no longer possessed his once-formidable power. Even his base running was affected, and at one point he collapsed at Al Lang Field, then the Yankees' spring training park. By the end of spring training, he had not hit a home run. Throughout his career, Gehrig was considered an excellent base runner, but as the 1939 season got under way, his coordination and speed had deteriorated significantly. I think there is something wrong with him. Physically wrong, I mean. I don't know what it is, but I am satisfied that it goes far beyond his ball-playing. I have seen ballplayers 'go' overnight, as Gehrig seems to have done. But they were simply washed up as ballplayers. It's something deeper than that in this case, though. I have watched him very closely and this is what I have seen: I have seen him time a ball perfectly, swing on it as hard as he can, meet it squarely—and drive a soft, looping fly over the infield. In other words, for some reason that I do not know, his old power isn't there... He is meeting the ball, time after time, and it isn't going anywhere. He was indeed meeting the ball, with only one strikeout in 28 at-bats; however, Joe McCarthy found himself resisting pressure from Yankee management to switch Gehrig to a part-time role. Things came to a head when Gehrig struggled to make a routine put-out at first base. The pitcher, Johnny Murphy, had to wait for him to drag himself over to the bag so he could field the throw. Murphy said, "Nice play, Lou." On April 30, Gehrig went hitless against the Washington Senators. He had just played his 2,130th consecutive major league game. 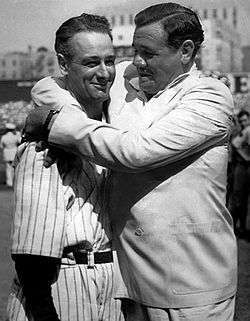 On May 2, the next game after a day off, Gehrig approached McCarthy before the game in Detroit against the Tigers and said, "I'm benching myself, Joe", telling the Yankees' skipper that he was doing so "for the good of the team." McCarthy acquiesced, putting Ellsworth "Babe" Dahlgren in at first base, and also said that whenever Gehrig wanted to play again, the position was his. Gehrig, as Yankee captain, himself took the lineup card out to the shocked umpires before the game, ending the fourteen-year streak. Before the game began, the Briggs Stadium announcer told the fans, "Ladies and gentlemen, this is the first time Lou Gehrig's name will not appear on the Yankee lineup in 2,130 consecutive games." The Detroit Tigers' fans gave Gehrig a standing ovation while he sat on the bench with tears in his eyes. A wire service photograph of Gehrig reclining against the dugout steps with a stoic expression appeared the next day in the nation's newspapers. He stayed with the Yankees as team captain for the rest of the season but never played in a major league game again. As Gehrig's debilitation became steadily worse, his wife Eleanor called the famed Mayo Clinic in Rochester, Minnesota. Her call was transferred to Charles William Mayo, who had been following Gehrig's career and his mysterious loss of strength. Mayo told Eleanor to bring Gehrig as soon as possible. Gehrig flew alone to Rochester from Chicago, where the Yankees were playing at the time, arriving at the Mayo Clinic on June 13, 1939. After six days of extensive testing at Mayo Clinic, the diagnosis of amyotrophic lateral sclerosis (ALS) was confirmed on June 19, 1939, which was Gehrig's 36th birthday. The prognosis was grim: rapidly increasing paralysis, difficulty in swallowing and speaking, and a life expectancy of less than three years, although there would be no impairment of mental functions. Eleanor Gehrig was told that the cause of ALS was unknown but it was painless, non-contagious, and cruel—the motor function of the central nervous system is destroyed, but the mind remains fully aware to the end. Following Gehrig's visit to the Mayo Clinic, he briefly rejoined the Yankees in Washington, D.C. As his train pulled into Union Station, he was greeted by a group of Boy Scouts, happily waving and wishing him luck. Gehrig waved back, but he leaned forward to his companion, Rutherford "Rud" Rennie of the New York Herald Tribune, and said, "They're wishing me luck—and I'm dying." Lou Gehrig's number 4 was retired by the New York Yankees in 1939. The Yankee dynamic duo reunited – Lou Gehrig and Babe Ruth at Yankee Stadium on July 4, 1939, shortly after Gehrig's retirement. Within a decade a similar testimonial would honor Ruth, who died from cancer in 1948. On June 21, 1939, the New York Yankees announced Gehrig's retirement. The doctors of the Mayo Clinic had released his ALS diagnosis to the public on June 19. There was then a public push to honor Gehrig. The idea of an appreciation day reportedly began with Bill Hirsch, a friend of sports columnist Bill Corum. Corum spoke of the idea in his column, and other sportswriters picked up on the idea, promoting it far and wide in their respective periodicals. Someone suggested the appreciation day be held during the All-Star Game, but when Yankees owner Ed Barrow got a hold of the idea, he quickly shot down the All-Star Game suggestion. He didn't want Gehrig to share the spotlight with any other all-star. Believing the idea was valid and the best thing to do, he wanted the appreciation day to be soon, and the Yankees proclaimed July 4, 1939, "Lou Gehrig Appreciation Day" at Yankee Stadium. Between games of the Independence Day doubleheader against the Washington Senators, the poignant ceremonies were held on the diamond. In its coverage the following day, The New York Times said it was "perhaps as colorful and dramatic a pageant as ever was enacted on a baseball field [as] 61,808 fans thundered a hail and farewell." Dignitaries extolled the dying slugger and the members of the 1927 Yankees World Series team, known as "Murderer's Row", attended the ceremonies. New York Mayor Fiorello La Guardia called Gehrig "the greatest prototype of good sportsmanship and citizenship" and Postmaster General James Farley concluded his speech by predicting, "For generations to come, boys who play baseball will point with pride to your record." Yankees Manager Joe McCarthy, struggling to control his emotions, then spoke of Lou Gehrig, with whom he had a close, almost father-and-son–like bond. After describing Gehrig as "the finest example of a ballplayer, sportsman, and citizen that baseball has ever known", McCarthy could stand it no longer. Turning tearfully to Gehrig, the manager said, "Lou, what else can I say except that it was a sad day in the life of everybody who knew you when you came into my hotel room that day in Detroit and told me you were quitting as a ballplayer because you felt yourself a hindrance to the team. My God, man, you were never that." The trophy cost only about $5, but it became one of Gehrig's most prized possessions. It is currently on display at the National Baseball Hall of Fame and Museum. When you look around, wouldn't you consider it a privilege to associate yourself with such fine looking men as are standing in uniform in this ballpark today? Sure, I'm lucky. Who wouldn't consider it an honor to have known Jacob Ruppert? Also, the builder of baseball's greatest empire, Ed Barrow? To have spent six years with that wonderful little fellow, Miller Huggins? Then to have spent the next nine years with that outstanding leader, that smart student of psychology, the best manager in baseball today, Joe McCarthy? Sure, I'm lucky. When the New York Giants, a team you would give your right arm to beat, and vice versa, sends you a gift—that's something. When everybody down to the groundskeepers and those boys in white coats remember you with trophies—that's something. When you have a wonderful mother-in-law who takes sides with you in squabbles with her own daughter—that's something. When you have a father and a mother who work all their lives so that you can have an education and build your body—it's a blessing. When you have a wife who has been a tower of strength and shown more courage than you dreamed existed—that's the finest I know. There is no known intact film of Gehrig's speech; only a small snippet of the newsreel footage has survived, incorporating his opening and closing remarks: "For the past two weeks you have been reading about the bad break I got. Yet today I consider myself the luckiest man on the face of this earth. . . . When you look around, wouldn't you consider it a privilege to associate yourself with such fine looking men as are standing in uniform in this ballpark today? . . . . that I may have been given a bad break, but I have an awful lot to live for. Thank you." The crowd stood and applauded for almost two minutes. Gehrig was visibly shaken as he stepped away from the microphone, and wiped the tears away from his face with his handkerchief. Babe Ruth came over and hugged him as a band played "I Love You Truly" and the crowd chanted, "We love you, Lou". The New York Times account the following day called it "one of the most touching scenes ever witnessed on a ball field", that made even hard-boiled reporters "swallow hard." On December 7, 1939, Lou Gehrig was elected to the National Baseball Hall of Fame and Museum in a special election related to his illness during the winter meeting by the Baseball Writers' Association. At age 36, he was the youngest player to be so honored to date (that figure would be surpassed by Sandy Koufax in 1972). He never had a formal induction ceremony. On July 28, 2013, he and eleven other deceased players, including Rogers Hornsby received a special tribute during the induction ceremony, held during "Hall of Fame Induction Weekend", July 26–29 in Cooperstown, New York. Lou Gehrig Way in New Rochelle, New York. He lived in a modest home at 9 Meadow Lane. "Don't think I am depressed or pessimistic about my condition at present", Lou Gehrig wrote following his retirement from baseball. Struggling against his ever-worsening physical condition, he added, "I intend to hold on as long as possible and then if the inevitable comes, I will accept it philosophically and hope for the best. That's all we can do." In October 1939, he accepted Mayor Fiorello La Guardia's appointment to a ten-year term as a New York City Parole Commissioner (Gehrig had moved from New Rochelle to Riverdale in order to satisfy a residency requirement for the job) and was sworn into office on January 2, 1940. The Parole Commission commended the ex-ballplayer for his "firm belief in parole, properly administered", stating that Gehrig "indicated he accepted the parole post because it represented an opportunity for public service. He had rejected other job offers – including lucrative speaking and guest appearance opportunities – worth far more financially than the $5,700 a year commissionership." Gehrig visited New York City's correctional facilities, but insisted that the visits not be covered by news media. Gehrig, as always, quietly and efficiently performed his duties. He was often helped by his wife Eleanor, who would guide his hand when he had to sign official documents. About a month before his death, when Gehrig reached the point where his deteriorating physical condition made it impossible for him to continue in the job, he quietly resigned. On June 2, 1941, at 10:10 p.m., Gehrig died at his home at 5204 Delafield Avenue in the Riverdale neighborhood of the Bronx, New York. Upon hearing the news, Babe Ruth and his wife Claire went to the Gehrig house to console Eleanor. Mayor La Guardia ordered flags in New York to be flown at half-staff, and Major League ballparks around the nation did likewise. 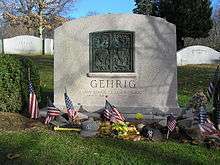 Following the funeral across the street from his house at Christ Episcopal Church of Riverdale, Gehrig's remains were cremated and interred on June 4 at Kensico Cemetery in Valhalla, New York, which is 21 miles north of Yankee Stadium in suburban Westchester County. Lou Gehrig and Ed Barrow are both interred in the same section of Kensico Cemetery, which is next door to Gate of Heaven Cemetery, where the graves of Babe Ruth and Billy Martin are both located in Section 25. The Gehrigs had no children during their eight-year marriage. Eleanor never remarried, and was quoted as saying, "I had the best of it. I would not have traded two minutes of my life with that man for 40 years with another." She dedicated the remainder of her life to supporting ALS research. She died 43 years after Lou on March 6, 1984, and was interred with him in Kensico Cemetery. The Yankees dedicated a monument to Gehrig in center field at Yankee Stadium on July 6, 1941, the shrine lauding him as, "A man, a gentleman and a great ballplayer whose amazing record of 2,130 consecutive games should stand for all time." Gehrig's monument joined the one placed there in 1932 to Miller Huggins, which would eventually be followed by Babe Ruth's in 1949. Gehrig's birthplace in Manhattan, at 1994 Second Avenue (near E. 103rd Street), is memorialized with a plaque marking the site, as is another early residence on E. 94th Street (near Second Avenue). (As of December 26, 2011, the first mentioned plaque is not present due to ongoing construction. The second mentioned plaque is present, but ascribes to his birthplace, not early residence.) The Gehrigs' white house at 5204 Delafield Avenue in the Riverdale section of the Bronx, where Lou Gehrig died, still stands today on the east side of the Henry Hudson Parkway and is likewise marked by a plaque. In 1999, editors at Sporting News ranked Lou Gehrig sixth on their list of "Baseball's 100 Greatest Players". 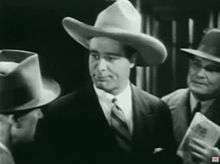 Gehrig starred in the 1938 20th Century Fox movie Rawhide, playing himself in his only feature film appearance. In 2006, researchers presented a paper to the American Academy of Neurology, reporting on an analysis of Rawhide and photographs of Lou Gehrig from the 1937–1939 period, to ascertain when Gehrig began to show visible symptoms of amyotrophic lateral sclerosis. They concluded that while atrophy of hand muscles could be detected in 1939 photographs of Gehrig, no such abnormality was visible at the time Rawhide was made in January 1938. "Examination of Rawhide showed that Gehrig functioned normally in January 1938", the report concluded. The life of Lou Gehrig was the subject of the 1942 movie The Pride of the Yankees, starring Gary Cooper as Gehrig and Teresa Wright as his wife Eleanor. It received 11 Academy Award nominations and won in one category, Film Editing. Real-life Yankees Babe Ruth, Bob Meusel, Mark Koenig, and Bill Dickey (then still an active player) played themselves, as did sportscaster Bill Stern. The 1978 TV movie A Love Affair: The Eleanor and Lou Gehrig Story starred Blythe Danner and Edward Herrmann as Eleanor and Lou Gehrig. It was based on the 1976 autobiography My Luke and I, written by Eleanor Gehrig and Joseph Durso. In an episode of the PBS series Jean Shepherd's America, the Chicago-born Shepherd told of how he and his father (Jean Shepherd, Sr.) would watch Chicago White Sox games from the right field upper deck at Comiskey Park in the 1930s. On one occasion, the Sox were playing the Yankees, and Shepherd Sr. had been taunting Gehrig, yelling at him all day. In the top of the ninth, with Sox icon Ted Lyons holding a slim lead, Gehrig came up with a man on base, and the senior Shepherd yelled in a voice that echoed around the ballpark, "Hit one up here, ya bum! I dare ya!" 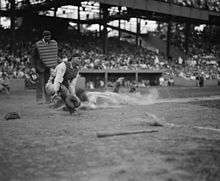 Gehrig did exactly that, hitting a screaming liner, practically into the heckler's lap, for the eventual game-winning home run. Shepherd's father was booed mercilessly, and he never again took junior Jean to a game. He apparently told this story originally when Gehrig's widow was in the audience at a speaking engagement. ↑ "Re-Discovering Lou Gehrig's Lost Nickname". Retrieved February 15, 2012. ↑ "All-Star Game History". Baseball Almanac. 2007. Retrieved July 4, 2007. ↑ "Lou Gehrig". Britannica Encyclopedia. Retrieved April 16, 2008. ↑ "A-Rod sets slam record, Yankees beat Giants 5-1". Associated Press. Retrieved September 21, 2013. ↑ "Lou Gehrig Grand Slams". Baseball Almanac. Retrieved April 16, 2008. ↑ "ESPN Classic – Iron Man Ripken brought stability to shortstop". Espn.go.com. Retrieved March 25, 2014. ↑ Frank Graham, Lou Gehrig: A Quiet Hero. Boston: Houghton Mifflin, 1969. 1 2 3 "All-Century Team final voting". ESPN. October 23, 2007. Retrieved January 8, 2009. ↑ "Plaque for Gehrig's Birthplace". The Miami News. Associated Press. August 22, 1953. Retrieved November 14, 2014. ↑ Robinson, Ray (July 3, 2005). "Gehrig Remains a Presence in His Former Neighborhood". The New York Times. 1 2 3 4 Eig, Jonathan (2005). Luckiest Man: The Life and Death of Lou Gehrig. New York: Simon & Schuster. pp. 3–4. ISBN 0-7432-4591-1. ↑ Robinson, Ray (1990). Iron Horse: Lou Gehrig in His Time. New York: W.W. Norton. pp. 30–31. ISBN 0-393-02857-7. ↑ Eig: pp. 7, 11. ↑ 1910; Census Place: Manhattan Ward 12, New York; Roll T624_1026; Page: 26B; Enumeration District: 683; Image: 431. ↑ 1920;Census Place: Manhattan Assembly District 11, New York; Roll T625_1205; Page: 18A; Enumeration District: 830; Image: 541. ↑ "Lou Gehrig (Revised Edition) – Kevin Viola – Google Books". Books.google.ca. 1903-06-19. Retrieved 2015-11-25. 1 2 "Commerce Team Wins". The New York Times. June 27, 1920. 1 2 Kashatus, William (2004). Lou Gehrig: A Biography. Westport, Connecticut: Greenwood Press. ↑ Robinson, Iron Horse: Lou Gehrig in His Time, p. 44. ↑ "P.S. 132 Historical Perspective". NYC Department of Education. Retrieved April 16, 2008. ↑ World Book Encyclopedia, Chicago: Field Enterprises, 1958, p. 2897. ↑ Robinson, Ray. "Lou Gehrig: Columbia Legend and American Hero". Retrieved April 16, 2008. ↑ Robinson, Iron Horse: Lou Gehrig in His Time, pp. 58–59. ↑ "Five things you didn't know about Lou Gehrig". yesnetwork.com. Retrieved May 1, 2015. ↑ Kashatus, William (2004). Lou Gehrig: A Biography (Baseball's All-Time Greatest Hitters) (Hardcover). Greenwood Press. ISBN 0-313-32866-8. ↑ "Murderers' Row and Beyond". Baseball Almanac. Retrieved April 18, 2008. ↑ "MVP BAseball Players". Baseball Reference. Retrieved April 18, 2008. 1 2 Newman, Mark. "Gehrig's shining legacy of courage". MLB.com. Retrieved April 18, 2008. 1 2 3 "Lou Gehrig". The Idea Logical Company, Inc. Retrieved April 18, 2008. ↑ "Box Score of Four Home Run Game by Lou Gehrig". Baseball Almanac. 2000. Retrieved August 5, 2008. ↑ "Equinoctial Climax". Time. October 5, 1936. Retrieved December 17, 2007. ↑ Beschloss, Michael (April 25, 2014). "When the Iron Horse (Almost) Played Tarzan". New York Times. Retrieved April 26, 2014. ↑ "Mike Tilden English 15 Gregg Rogers 24 October 2002 September 11 Defines "American Hero"" ( – Scholar search). Retrieved April 17, 2008. ↑ Getlen, Larry (February 28, 2010). "The Baseball Codes". New York Post. Retrieved February 28, 2010. ↑ Greenberg, D.A. ; Jin, K. (2004). "VEGF and ALS: the luckiest growth factor?". Trends in Molecular Medicine. 10 (1): 1–3. doi:10.1016/j.molmed.2003.11.006. PMID 14720577. 1 2 3 4 Malik, N. (2000). "Lou Gehrig's Disease: A Closer Look at the Genetic Basis of Amyotrophic Lateral Sclerosis" ( – Scholar search). Pediatrics. 3 (3). Retrieved April 17, 2008. ↑ Bob Chick (February 24, 2008). "Spring Training In Tampa — The Final Out". The Tampa Tribune. ↑ Robinson, Iron Horse: Lou Gehrig in His Time, p. 248. ↑ Walling, A.D. (1999). "Amyotrophic lateral sclerosis: Lou Gehrig's disease.". Am Fam Physician. 59 (6): 1489–96. PMID 10193591. ↑ Robinson, Iron Horse: Lou Gehrig in His Time, pp. 251–253. ↑ Eig, Jonathan (2005). Luckiest Man: The Life and Death of Lou Gehrig. New York: Simon & Schuster. ISBN 0-7432-4591-1. ↑ Robinson, Iron Horse: Lou Gehrig in His Time, p. 258. ↑ Cardoso, R.M.F. ; Thayer, M.M. ; Didonato, M.; Lo, T.P. ; Bruns, C.K. ; Getzoff, E.D. ; Tainer, J.A. (2002). "Insights into Lou Gehrig's Disease from the Structure and Instability of the A4V Mutant of Human Cu, Zn Superoxide Dismutase". Journal of Molecular Biology. 324 (2): 247–256. doi:10.1016/S0022-2836(02)01090-2. PMID 12441104. ↑ Kaden, S. (2002). "More About His ALS Battle". Retrieved April 16, 2008. ↑ McKee, A.C., et al. : TDP-43 Proteinopathy and Motor Neuron Disease in Chronic Traumatic Encephalopathy. Journal of Neuropathology & Experimental Neurology: September 2010 – Volume 69 – Issue 9 , pp. 918–929 retrieved October 9, 2015. ↑ Schwartz, A. (August 17, 2010). Study Says Brain Trauma Can Mimic A.L.S. New York Times archive, retrieved October 9, 2015. ↑ Frank, David (Aug 17, 2010). "Study Finds Trauma May Mimic A.L.S.". The NY Times. Retrieved Nov 4, 2016. ↑ Schwarz, Alan (Aug 17, 2010). "Study Says Brain Trauma Can Mimic A.L.S.". The NY Times. Retrieved Nov 4, 2016. ↑ "What's to learn from Lou Gehrig's death?". Star Tribune. Associated Press. October 9, 2012. Retrieved March 25, 2014. 1 2 3 John Drebinger, "61,808 Fans Roar Tribute to Gehrig", The New York Times, July 5, 1939. ↑ Belli, R.F. ; Schuman, H. (1996). "The complexity of ignorance" (PDF). Qualitative Sociology. 19 (3): 423–430. doi:10.1007/BF02393279. Retrieved April 17, 2008. ↑ Greenberger, R. (2003). Lou Gehrig. The Rosen Publishing Group. ↑ "The Day He Retired". tripod.com. Retrieved May 1, 2015. ↑ "Farewell Address". lougehrig.com. July 4, 1939. Retrieved December 12, 2013. ↑ Wulf, Steve (July 4, 2014). "'An awful lot to live for'". ESPN. Retrieved July 14, 2014. ↑ "Full Text of Lou Gehrig's Farewell Speech". Sports Illustrated. Retrieved July 14, 2014. ↑ Gehrig delivers his famous speech at Yankee Stadium. YouTube. July 1, 2014. Retrieved May 1, 2015. 1 2 Robinson, Iron Horse: Lou Gehrig in His Time, p. 266. ↑ "Henry Louis Gehrig". National Baseball Hall of Fame and Museum, Inc. National Baseball Hall of Fame and Museum, Inc. Archived from the original on April 3, 2008. Retrieved April 18, 2008. ↑ Cleveland, D. W.; Rothstein, J. D. (2001). "From Charcot to Lou Gehrig: deciphering selective motor neuron death in ALS" (PDF). Nat Rev Neurosci. 2 (11): 806–19. doi:10.1038/35097565. PMID 11715057. Retrieved April 17, 2008. ↑ Yardley, Jonathan. "Book World Live: Luckiest Man: The Life and Death of Lou Gehrig", The Washington Post, April 5, 2005. Accessed May 3, 2008. "On June 2, 1941, just days short of his 38th birthday, Henry Louis Gehrig died at his house in the pleasant New York City neighborhood of Riverdale." ↑ Time magazine, June 16, 1941. ↑ Innes, A.M.; Chudley, A.E. (1999). "Genetic landmarks through philately- Henry Louis'Lou' Gehrig and amyotrophic lateral sclerosis". Clinical Genetics. 56 (6): 425–427. doi:10.1034/j.1399-0004.1999.560603.x. PMID 10665660. ↑ "100 Greatest Baseball Players by The Sporting News : A Legendary List by Baseball Almanac". Baseball-almanac.com. Retrieved March 25, 2014. ↑ The Lou Gehrig Memorial Award was created by the Phi Delta Theta fraternity in his honor and is given to players who best exemplify Gehrig's character and integrity both on and off the field. Since the award was created in 1955, the name of each winner has been placed on the Lou Gehrig Award plaque in the Baseball Hall of Fame in Cooperstown, New York. ↑ Melissa Lewis Paul H. Gordon (July 13, 2006). "Lou Gehrig, Rawhide, and 1938". American Academy of Neurology. Retrieved April 22, 2008. ↑ Partridge, Ernest. "Jean Shepherd – 1921–1999". Retrieved April 16, 2008. ↑ Gehrig hit eight home runs off Ted Lyons, two of them in Chicago: one in 1927 and another on June 25, 1936. The Yankees did indeed win this game by a single run, 7-6, but the homer was not hit in the ninth inning. ↑ "June 25, 1936 New York Yankees at Chicago White Sox Play by Play and Box Score – Baseball-Reference.com". Baseball-Reference.com. Retrieved May 1, 2015.